Silas brushes back his cloak and shifts his weight to one foot. "Steal? There's an ugly word, and I try to avoid ugly words. Redistribution, now that's better. See, stealing implies I've something personal against you, and that's not the case at all. I've no problem with you, just your money, and my problem with that, is that it's not mine." He pauses for a moment, then takes a half step towards you. "Now here's a good lad. Why don't you run off," a flash of something pointed and shiny appears and disappears beneath his cloak, "before we have us a heap of mason's." His eyes flick past yours to something behind you, and as you turn your head to look you instantly know it was the wrong thing to do. You close your eyes, reaching your trembling hand for the familiar weight of your purse, but you already know it's gone, along with the man who claimed it. Silas Porter, known as "The Pick" among those with flexible morals, cuts a lean figure at 6'1" and 180 lbs. His features are unremarkable, and his movements are fluid and effortless akin to the timeless grace of an elf, if the elf in question were drunk and liked to take things that didn't belong to him. He currently serves the Simbulmyn of his own free will, investigating "events of interest." The fact that he only really does it in order to satisfy his own natural curiosity and to gain personal wealth hasn't seemed to bother anybody yet. 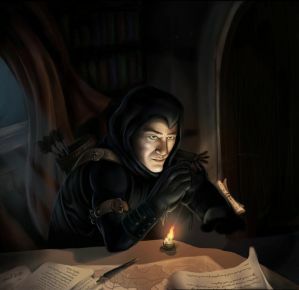 When adventuring, Silas wears a full set of Shadowsilk Armor, a Cloak of Elvenkind, and a Hat of Disguise, which he typically uses to avoid looking like himself, and to hide his recently acquired mask of Mask. If he is "working" at night, or else dungeon crawling, he casts Ebon Eyes on himself, which causes a dark film to cloud his eyes. He typically spends most of his time hiding in the shadows, waiting for the right time to snipe an enemy with his +1 Composite Longbow [+3] of Seeking. Things never seemed to turn out the way Silas Porter wanted them to. mad at him for that. then he should have been more careful. pride, and vowed to keep his more curious natures in check. locked door. Specifically, a cell door. Simbul's Keep and remove a token of her power. If only he had encountered a Burning Hands trap. to perform for The Simbul before his crime of trespassing was repaid.